Upcoming new Tollywood Bengali film Challenge 2 movie story review castings director producer actors actresses Challenge 2 release dates book buy tickets online Bengali Challenge 2 Dev & Pooja Bose. Challenge 2 Dev & Pooja Bose. New Bengali movie review plot shooting location cinema halls showing Challenge 2 Kolkata Bengal show timings upcoming hit Bengali cinema Challenge 2 watch online details information. Actress Pooja Bose, last acted in Macho Mastana Bengali film, paired up with superstar Tollywood actor Dev for the first time in Raja Chanda’s upcoming Bengali movie Challenge2, which thought as a sequel of Raj Chakraborty’s Challenge Bangla cinema. Film-maker Raja Chanda's Bengali film Challenge-2 of Dev & Pooja has quite a few things that is going to happen for the first time ever in Tollywood Bengali Film Industry - Actor Dev & Director Raja Chanda working for the first time, Actor Dev & Actress Pooja Bose paired-up for the 1st time and Actor Dev is in the Role of a Cop for the 1st time. So, the upcoming Bengali movie Challenge-2 will have extra ‘masala’, isn't it? Let me tell you one more interesting fact about Challenge 2 Bangla Cinema of Dev, renowned film director Raj Chakraborty, who was the director of Dev’s Challenge Bengali Movie, will play a crucial character in Raja Chanda directed film Challenge 2. • Challenge 2 Bengali movie Director Name: - Raja Chanda. • Challenge 2 Bengali movie Producer name: - Srikant Monhta & Shree Venkatesh Films. • Challenge 2 Bengali movie Music Director Name: - Jeet Ganguly. • Challenge 2 Bengali film Casts Actors Actresses: - Dev [Deepak Adhikary], Pooja Bose, Tapas Paul, Rajatava Dutta, Kharaj Mukherjee, Raj Chakraborty and many others. • Challenge 2 Bengali movie Release Date: - 19th October 2012. • Challenge 2 Bengali movie Story Review: - Actor Dev will be seen in a very challenging role of a Cop in the Bengali film Challenge-2 and will not play the adorable lover-boy role. The Story of Bengali Film Challenge 2 is based on Father-Son relationship. Dev [playing the role of Abhiraj] is a Cop, son of Tapas Paul, and actress Pooja Bose [character name Puja] is a Fashion Designer in Challenge 2 Bengali film. Challenge 2 shows how a cop fights against the corruption & not stayed back because of his relations. There are so many fighting scenes of Dev, who will be seen in a tough & fighting avatar. • Shooting Location Spot of Challenge 2 Bengali Cinema: - Avani Mall (Howrah), Uttarpara-Bally Rajbari, Kolkata & other places of India & Abroad. • Cinema Halls showing Challenge 2 Bengali movie: - The Advance Ticket Booking of Challenge 2 Cinema started on & from 17th October 2012 (Wednesday) and now let’s check out few Cinema Hall names showing Challenge 2 Movie in Kolkata & other areas of West Bengal – Mitra, Prachi, Indira, Priya, Naveena, Ragini, Metro, Jaya (Laketown & Barasat), Aleya, Padmasri, Mahua, Puspasri (Behala & Kadamtala), Ashoka (Behala & Triveni), Inox (Forum, Rajarhat, Liluah, Burdwan, Durgapur, Siliguri-1 & 2), FAME (Hiland Park, & South City), Ajanta, PVR Avani Mall (Howrah), Bioscope (Rajarhat & Durgapur), Big Cinema (Salt Lake), CineMax (Mani Square & Siliguri), London Parris (Ballygunj), Eylex (Asansol), Anjana, Sarama, Aarati, Sonali (Dunlop), Narendra, Rathindra Cine 1, Atindra, Debasri, Jayanti (Barrackpore, Rishra & Dongaria), Baruipur Show House, New Bijoli, Mahamaya (Dakshin Barasat), Rupkatha (Habra, Gobindapur, Bisnupur, Hariharpara), Jyoti (Chandannagar, Machlandapur & Domkal), Gitanjali (Bolpur), Kalyani (Naihati, Panduah & Mallarpur), Shankar (Habra & Purulia), Sujata (Bagnan), Gouri (Falakata & Buniyadpur), and many others. Challenge 2 Cinema will also be shown at Assam [Cinema hall names – CineStop, Durga, Aurora etc. ], Bihar [Cinema hall names – Eylex (Ranchi & Jamshedpur), CinePolis etc. ], Tripura, Orissa and Mumbai [Cinema hall names – Alankar, Vandana, Meghraj Multiplex, Tilak, Max Multiplex etc.] also. New Bengali movie / Tollywood film Challenge 2 of Dev & Pooja Bose seems to be worth watching in Cinema Hall; so start buy tickets online of Challenge 2 from www.bookmyshow.com website. Upcoming new Tollywood Bengali film Ullash movie story review castings director producer actors actresses Ullash release dates book buy tickets online Bengali Ullash Tapas Paul & Satabdi Roy. Photos pictures wallpapers download mp3 songs Ullash Tapas Paul & Satabdi Roy. New Bengali movie review plot shooting location cinema halls showing Ullash kolkata Bengal show timings upcoming hit Bengali cinema Ullash watch online details information. RNR Enterprise presents Ullash Bangla Cinema under the direction of filmmaker Ishwar Chakraborty, who featured actors like Soumitra, Tapas Pal, Shatabdi Roy etc. Renowned author Mahasweta Devi has written the story of Bengali film Ullash and will be seen in a short character in the film as well. • Ullash Bengali movie Director Name: - Ishwar Chakraborty. • Ullash Bengali movie Producer name: - Shankar Sarkar. • Ullash Bengali movie Story written by renowned author Mahasweta Devi. • Ullash Bengali film Casts Actors Actresses: - Soumitra Chatterjee, Mahasweta Devi, Tapas Paul, Shatabdi Roy, Biplab and many others. 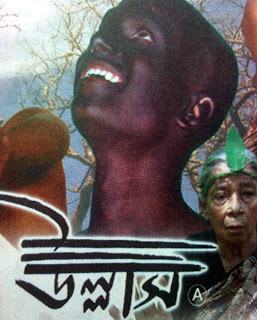 • Ullash Bengali movie Release Date: - 29th June 2012. • Cinema Halls showing Ullash Bengali movie: -Nandan-1, Star, Menoka, Minar (Noon Show), Jaya (Lake Town & Barasat), Mahua (Garia), Malancha (Tollygunge), Ashoka (Behala), Jayanti (Barrackpore), Milan (Baruipur), Big Cinema (Sector-V Salt Lake), Broadway (Salt Lake), PVR (Howrah), Asansol Ilex and many other Cinema Halls in West Bengal will show Bengali film Ullash from 29th June 2012 onwards. Tollywood film Ullash of Tapas Paul & Satabdi Roy, upcoming new Bengali movie, seems to be worth watching in Cinema Halls; so start buy tickets online of Ullash from www.bookmyshow.com website. Gyan Ratna Competition has been organized by the team of Ullash film. Let’s check out how to participate in the Gyan Ratna Ullash Competition – Those who have watched the Ullash Bengali Movie in any Cinema Hall can participate in Gyan Ratna Competition and to participate; you need to write your views about ‘Ullash’ film. Views about the film ‘Ullash’ along with your details [name, age, address, phone number, cinema hall name where you watched the movie] and photocopy of cinema hall ticket to ‘9/3 Ekdalia Road, Kolkata-19’ by post –or- to rnr_dc@rediffmail.com by email. Judges like Mahasweta Devi & others will read your views and will select best three nominees. Rs.1 lakh, Rs.50 Thousands & Rs.25 Thousands will be awarded to the 1st, 2nd & 3rd positions and top-100 nominees will get Mahasweta Devi’s Rachanavali as well. You all should send your views within the 90-days from the release date of Ullash movie i.e., 29th June 2012.